People at time struggle in life despite their hard work and good deeds. The reason behind this, is said to be the unfavorable position of the planets, permanently of transitorily one’s horoscope, planets, no doubt, have the direct influence on the human beings according to the ancient astrophysicists like varahamihira. At the same time our ancestors, after through research, had found out the method of appeasing the adverse influence of the planets through sound waves i.e mantras Sanskrit being the divine language more sharp to establish connection with the ethereal religion, the Mantras chanted in that language has doubtless efficacy. The stotras too have the power of healing. Both the mantra and the Stotra are like the virus scanner of the mind and physique both in the micro and macro cosmic body of the universal the listening and the chanting of the Mantras and stotras, therefore, removes all ills of human beings due to the power of vibrating spells, and paves way for a happy life of peace pleasure and prosperity! 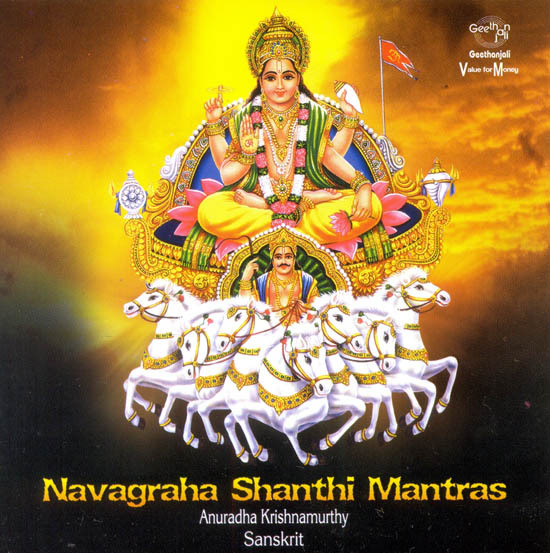 With this in view here is a unique presentation of Navagra a Shantii Mantras, introduced for the first time, being judiciously and effectively compiled by Dr.R. Thiagarajan, the head' of the' postgraduate and research department of Sanskrit Presidency College, Chennai and being sung with phonetic perfection by Mrs. Anuradha Krishnamurthy, a traditional carnatic musician under the guidance of Mr. V.R. manikka Vinayagam, a reputed Music Director. This compact disc beings with a prayer to Lord Vinayaka (the remover of obstacles) and each planet is meditated upon with a Dhyana followed by the Gayathri Mantra of the respective planet in its sequence. The most suitable Soundarya Lahari hymn of Adi Sankara, which is intended 'to appease the planet respectively has been included, which is among the special features of this disc. As the Jupiter and the Saturn have the noticeable impact on us on their transit zodiac, a special attention has been given to both of them. Hence, this disc includes in it the famous -Guru Ashtakam” of Adi Sankara tuned melodiously and the Ashtottara chanting of sanaischara. The prayer for all the planets put together forms the climax and concludes the Disc.